Learn how to get those coveted Disney character photographs and autographs with our tips and information! PassPorter's Disney Character Yearbook is a 266-page compendium of all the live Disney characters you can find at Walt Disney World, Disneyland, and on the Disney Cruise Line. It offer advice and tips on finding, meeting, photographing, and getting autographs from our Disney friends, as well as profiles on over 200 Disney characters. We also include a personalizable autograph book at the end of the e-book for you to print and assemble. Whether you're an autograph hound, or just curious about the identity of that scraggly fox in the mashed top hat you saw at the Magic Kingdom, this is a FUN e-book to have! Many thanks to Chad and Nicole Larner who co-authored it with us, and to the many PassPorter readers who uploaded their Disney character photos so we could link to them from the e-book. Finding, Meeting, Photographing, and Autographing -- this is a 21-page section full of general information, tips, and helpful links. Includes two pages of photography tips and five pages of reader tips, too! Character Profiles -- this is a 210-page section devoted to each Disney character you can meet at Walt Disney World, Disneyland, and/or the Disney Cruise Line. Each character gets their own page and we include background, personality, dress, friends, foes, likes, dislikes, quotes (from them or to them), locations (including attractions and parades), and a box for your own photo (plus links to PassPorter reader photos of that character). Personalized Autograph Pages -- this is a 22-page section of autograph pages you can personalize, print, and assemble! Important Note: This e-book is NOT a general travel guide that covers all the ins and outs of planning a Disney vacation. Instead, this e-book focuses on enhancing the information and tools in our general guidebook, which we assume you will have (or don't need) if you use this file. This e-book is available to purchase in our store for only $7.95 or get this e-book now and FREE of extra charges as part of the PassPorter's Club program starting at $4.95 a month with access to ALL our e-books and e-worksheets! 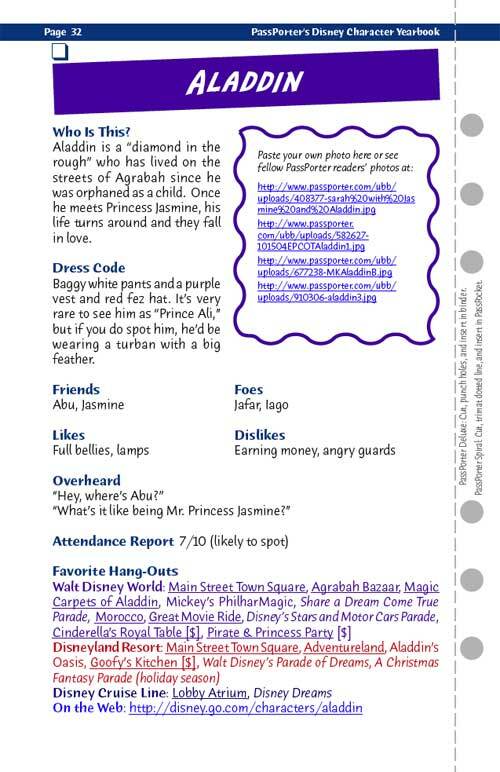 "PassPorter's Disney Character Yearbook" is 268 pages and 5.9 MB. And like all our e-books, this file is fully-formatted just like a regular print book... it will even fit into a Deluxe PassPorter Binder, if you have one. BONUS: Owners of this e-book receive a valuable 30% off discount coupon for any of PassPorter's print guidebooks! The coupon is located inside the e-book (page 263). Terms: Satisfaction is guaranteed! If you are unhappy with this e-book, we will issue a refund. If you are unsure about purchasing this e-book, please be assured that PassPorter is trustworthy. We have been selling our guidebooks online and in bookstores since 1999 -- we have over 250,000 happy readers! Ask about us on Disney message boards!